Kilis Flag Officer Canbulat is suggested to adhere in the army prepared to conquer Cyprus. Because he has made big effort at the time of the Ottomans conquering Nicosia, in 1570 along with Iskender Pasha and Deniz Pasha, he is given the duty with the Ottoman army for conquering Magusa. 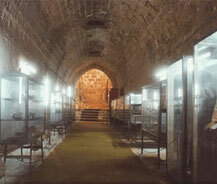 Because he was thought to have died a martyr in the place where Arsenal Citadel is, his tomb is under this citadel. The building frayed in time, has been restored in 1968 and the front was turned into a museum. Still, in the museum ethnographical and archeological pieces are exhibited.